As I had a non-optional two week break from work over Christmas I took the opportunity to get a few days in Austria without losing any (more) money! 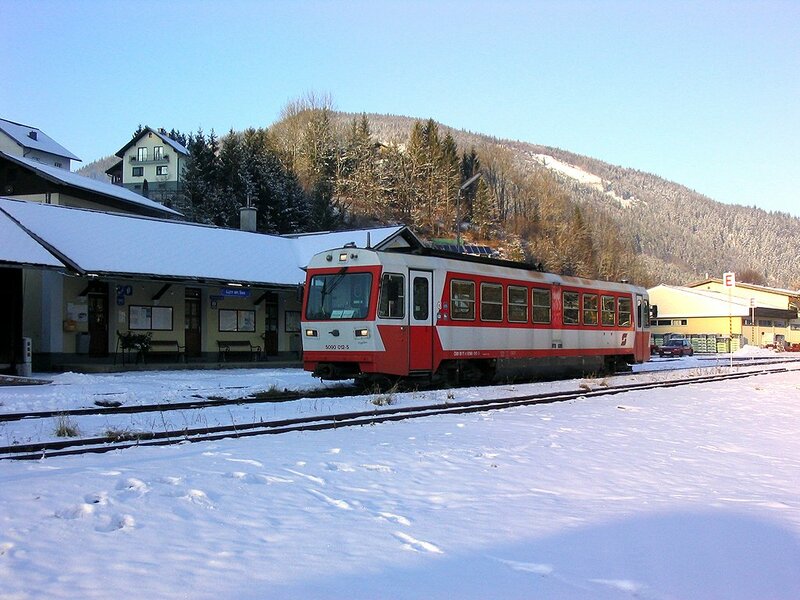 Although the middle of winter provides very restricted daylight hours I was able to work out a plan which allowed me to do the Ybbstalbahn and Mariazellerbahn systems in daylight and get a few other oddments in as well. 10 years after the desperate Boxing Day dash to Germany to do Querfurt-Vitzenburg I was off for another post-Christmas visit, this time to Austria. My favourite TOC (not) started in characteristic style, with their grubby 158 9 minutes late and devoid of any heating, on a morning with the outside temperature hovering around freezing. An 18 minute connection at Smethwick Galton Bridge was reduced to 10 by the late running but it was still 8 minutes too long at a horribly cold station with no heat in the minimal waiting rooms. All of that said, it seems a good idea to stop the ATW trains at Galton Bridge. It’s only been happening for 12 days so not well established, but still 8 people joined me for the Marylebone connection. Chiltern turned up spotless, on time and with heat, and left Moor Street no more than a quarter full. This on a day when XC (or at least Virgin, on their behalf) hadn’t been able to provide me with a reserved seat. Impeccable run to Banbury, on time everywhere except for a few seconds late at Warwick. 0855 XC Banbury to Bomo was displayed 5 late, announced 3 but was actually no more than 2 – with plenty of empty seats. It rocked, rolled and stank happily enough to Reading, fast line from just east of Didcot to just west of Reading, and ending up in P9 at Reading. I don’t know if it was on time but it must have been close. On from Reading on FGW’s 0948 stopper to Paddington, a tidy enough (and deserted) 166. A gentle potter along the slow lines for this one, arriving Slough 3 late at 1016. It was a perfectly comfortable journey in the end (if you ignore the freezing at Smethwick GB). There followed a depressing wander the length of Slough High Street, first to the town’s only GBG entry which didn’t appear to have its opening hours displayed, then the other way to the Stoke Poges turn. I was surprised to cross a decrepit looking single line just before that – surely not the Windsor line? But if not, what else? [It was the Windsor line, of course.] The shops seemed very quiet despite low sale prices. [No doubt when I re-read this in a few years’ time I’ll have forgotten just how woebegone the UK economy currently is. But after all the assurances that boom and bust was a thing of the past, this spectacular decline is a very unwelcome novelty.] Ended up at ‘Spoons which was quite well patronised at 11:05 and provided (eventually, and rather grudgingly – this was ‘Spoons after all) a drinkable pint of Rebellion Mince Spy. Most of the cask beers were off (‘ready soon’ in ‘Spoons jargon) including the Badger one I’d have liked to try. Thence to Tesco for a sandwich which however bad it may be [it was] will surely be better than BA’s. Finally back to the bus station for the excellent no 77 bus to LHR T5. 17 minutes in a nice warm, clean, comfortable bus which drops off/picks up at the door of T5 – and free for us geriatrics! Indifferent Deuchar’s IPA in the ‘Crown Rivers’ (T5’s airside ‘Spoons) after a quick passage through security (though a very thorough patting down when I set the alarm off for some reason). [I found out, on the return trip]. An uneventful flight in an A320 to Wien followed, regrettably with a bus to the terminal. I’m getting the hang of this now however, and was first through immigration which enabled me to get the 18:18 S-Bahn without too much drama. Scheduled departure from LHR was 14:35 – we left the stand at 14:33, were de-iced and airborne at 14:48 and landed at 17:49 local time, so 121 minutes flying time instead of the announced 130. 06:30 breakfast didn’t materialise (surprise). I was sent away until 07:00. Returned at 07:05 whereupon the two ladies started to put the breakfast out… By the time I’d had breakfast, rousted the reception bod out from his unmarked lair on the first floor and he’d dealt agonisingly slowly with my bill, it was almost 07:40. I consequently missed 07:33 tram but got to Keplerplatz 3 minutes before a U1, and Karlsplatz 1 minute before a U4. This very lucky draw got me to Friedenbrücke for a short walk to Franz Josefs Bf., arriving there at 08:05 in good time for 08:15 to Nußdorf, a 4020 (electric kart). FJBf is an underbuilding concrete cavern with an office block above. Very unprepossessing and reminiscent of EUS and BHM. Out to Nußdorf on the kart, and only a minute to wait there for tram D to take me back to the amazing multi-level Spittelau. Once I’d made my way up to the top level (obviously, for a U-bahn…), there was only 2 minutes to wait for a U6 to Westbahnhof. [I didn’t note it at the time, but ‘U’6 runs on a brick viaduct most of the way to Westbf and is a quite interesting ride. It finally goes into tunnel after Thaliastrasse.] With plenty of time to spare I elected to go for the 09:18 stopper to St. Pölten but it arrived late and showed every sign of being delayed enough to be held somewhere en route for EC162 Wien-Basel to pass. I baled out, therefore, and settled for a nice comfortable seat in an SBB second open on the EC. The connection for Mank at Ober Grafendorf was held, hardly a surprise. This was a single unit diesel, 5090 016. More comfortable seats and a better ride than the ancient stock on the electric line, it must be said. It’s a pleasant Czech-style potter through the fields to Mank – nothing exceptional but a nice enough way to while away Sunday morning [though nicer to have done the rest of the line!] Kilb has a passing loop with points sprung so that trains take the right hand line in each direction. Back at St Pölten a long cold walk was had to find the site of the alleged hausbrauerei at Rennbahnstr. 29 which seems to have been demolished. 21 and 23 are there, then some industrial buildings, then a suspiciously new looking gravelled car park! Back via the town centre which is virtually pub-free and certainly so on a Sunday. I managed to resist the cans in the station shop at €2.60 (almost £2.60) having bought one at Wien Südbf last night for €1.60! What a trudge to Mariazell – well, the first 1½ hours anyway, with 1099.011. The last hour is a different matter, with long stretches at 1 in 35, two U-turns and views some 250m down to where you’ve just been. And the bothy at Mariazell was open – under the circs €2.20 for a can of Puntigamer just had to be handed over! Different train set to go back, with slightly posher seats and a bear-related décor inside and out [this was the Öscherbär set]. Even more of a trudge back in the dark, not helped by a late running southbound train which we had to wait to cross, and what seemed like very casual station work. 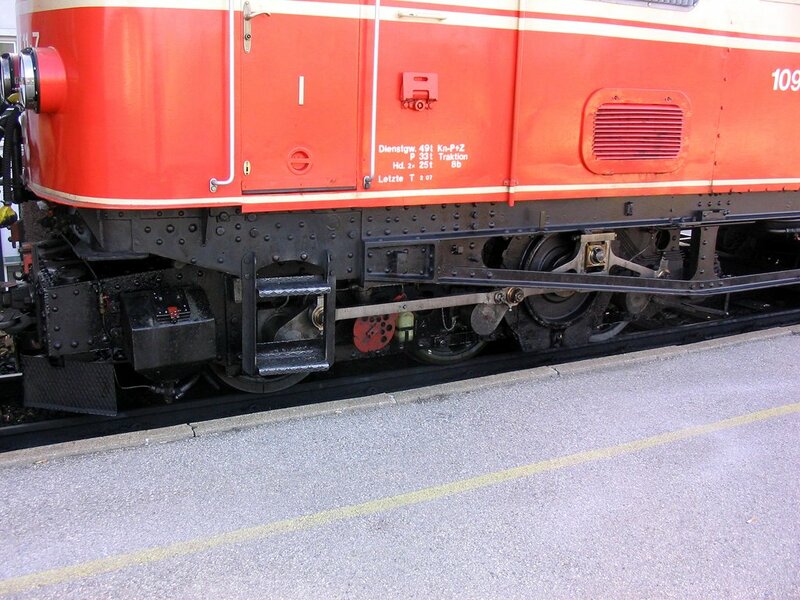 Whether or not, we were 15 late at St Pölten (where the bear-liveried loco was noted as 1099 010). That still left time for a very welcome McDonalds – never thought I’d write that, but then I’ve never done 7 hours on the narrow gauge on a winter Sunday either. The onward connection to St. Valentin behind 1016 069 was an unwelcome 4 late but its warm and near-empty state was highly satisfactory! Just over a minute late arriving at Amstetten, which with a 27 minute timing for 66 km was pretty creditable – and Amstetten got us away under a minute late. It’s a far cry from the narrow gauge. Not only that but an on time arrival at St. Valentin, slightly bettering the booked 100 mph average (40 km, 15 mins). The hotel was still functioning despite my fears that on a late December Sunday it might have closed early (arrived 2120 vs 2200 close) so all was well. 1144 213 heads the late running REX 1614, 09:15 Wien Westbf - St. Valentin at Wien Westbahnhof on 28.12.08. 760mm gauge diesel railcar 5090 016 at Mank working R6870, 11:35 SuO Mank - St. Pölten Hbf, 28.12.08. Beyond the unit the line continues out of use towards Wieselburg an der Erlauf. This shot of 1099 011 shows the arcane drive arrangement where a single motor is driving all three axles. 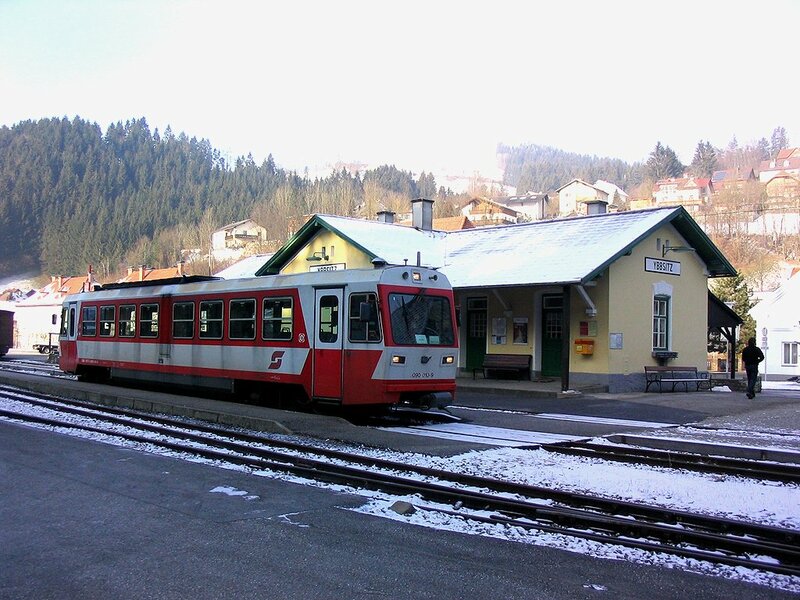 1099 010, seen here at Mariazell with the "Ötscher Bär" train set in its rather drab brown livery. 1099 011 is in the background. Up betimes, to the worrying discovery that my fancy new alarm clock sets itself to GMT… After a minor skirmish with the front door (due to my own stupidity) I was away for the 06:48 ALFA (a class 5022, Talent I think) to Aisthofen for a try at the St Pantaleon – Ennsdorf curve which is used by trains from the Sarmingstein line to Linz. Having seemingly missed a stop it seemed a good plan to bale at Schwertberg rather than Aisthofen – and it probably was, since Aisthofen’s a request stop and at that stage I hadn’t figured out the procedure. Back, frozen, round the required curve (which goes under the new high speed line) to Enns for a half hour wait to go back to St. Valentin and breakfast. I went for a walk to keep warm and managed, as so often in the past, to avoid the town centre! I did encounter a 15th century basilica and a Roman house though, so that was sightseeing duty done. Not a word of English to be had in the hotel but breakfast was to be had and I had time for a wash and brush up before the crowded 08:48 IC to Amstetten with the inevitable 1016 up front. On time at Amstetten, natürlich. I went for a wander in search of supplies and found a Pennymarkt which gave me a lesson in prices. A fruit and water order cost me €0.86 as compared with €1.92 at Wien Westbf yesterday, the latter in a station supermarket where prices didn’t seem that high! Out of idle curiosity I also visited a ‘consumer electronics’ shop in Amstetten, somewhere in the Dixons/Currys/Maplin sort of area but with in-house optician à la Boots. Interesting to see the difference. Prices at the current 1:1 seemed roughly like the UK. 1142 554 arrived cross platform with the stopper from St. Valentine at 09:57 – I might have been worrying a little had I decided on the leisurely breakfast approach and got that instead of the earlier IC. My train to Waidhofen was at 09:59. 7 late leaving Amstetten for a 5 minute connection. Can’t really see that worrying them so I’ll hope for the best. Quite justified – we were barely 5 late and 5090s 010 and 012, grubby but warm, were indeed held for 3 minutes. Well, nearly. Long enough anyway. It’s a nice little wander up to Ybbsitz and being the first and only train of the day we were busy wiping ice of the rails. Unlike ATW’s 158s, ice on the rail seemed not to bother the 5090. To the non-civil engineer, the track felt and looked fairly ropey after Gstadt. On arrival at Ybbsitz I checked the yellow sheet out of habit/instinct. Lucky I did – not only is this the only train of the day but according to the sheet it returns at 11:36 not at 11:54 as indicated on the Internet. Plans to go to the pub were therefore abandoned in favour of a very acceptable Murauer Märzen from the Spar at an equally acceptable €0.73. Possibly the only beer label I’ve seen which featured, inter alia, Y-fronts and smelly socks (‘stinke-socken’ – translated easily enough even without the cartoon!). Wrong on all counts – printed/Net timetable seems to be total fiction or at least very much at odds and, oh, half a dozen pax on the train which looks like going at 11:54! It did go at 11:54 and punctiliously waited at all the mandatory stops. I baled at Schillerpark which is handy for the town centre of Waidhofen. It’s a nice little market town with two market places on different levels. Bit of a shortage of open pubs; maybe Austria has the Belgian attitude to Monday, or maybe the British one to Christmas. I did find one in the end though. Festbock? Nein. Feuerbier? Nein – Zipfer oder Heineken. Well, would you rather be punched, bored or countersunk. Zipfer at £3.50/pint had to do. In terms of availability it was rather ‘Spoons-like but the service was far quicker (and to be fair, the beer was more expensive). Back to Schillerpark in time to get the incoming 5090 012 to Waidhofen ‘proper’ and save myself another ten minutes’ freezing. This also provided an invaluable opportunity to visit the station facilities before 1¾ hours to Lunz on a closettally challenged kart! A little bit bland to Lunz by local standards – a wide, flat bottomed, steep sided valley which presumably means glacier. Oddly there’s one narrow part – not sure how that would work with a glacier! Lunz is a pretty village in the summer I’d imagine, but was fairly bleak on this very cold afternoon. Mercifully it’s got a proper pub and it’s open, so in for a Stiegl without more ado, armed with the foreknowledge of the operational and heated toilets at the station! Rod Stewart ‘Sailing’ in the pub as opposed to the Boxtops receiving ‘The Letter’ at Waidhofen! Will Austria make it to the 21st century? I think we should be told. Another boring trundle back to Waidhofen in (mostly) the dark, with a 20 minute break at Grosshollenstein to lengthen the proceedings. An on time arrival at Waidhofen was no great surprise, and the connection on to Amstetten was more or less on time too. My Interrail got its first grip of the day at around 18:35, possibly a record. After several signal checks we went right across the layout at Amstetten thus obliging me with the physical connection and dropping me off at the door of the station buffet for a Wieselburger and a schnitzel. It came to a tenner which under the circs is OK I suppose. I’ll be glad if we ever get back to €1.40 or €1.50 and I can stop wittering on about prices! 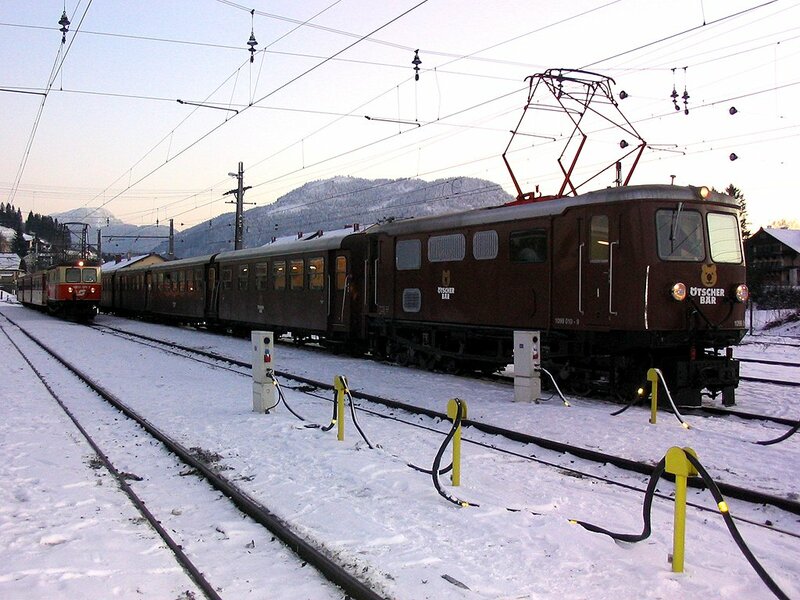 1116 073 bowled in (and out) on time with IC740, 19:57 to Salzburg, saing me from certain death from hypothermia on the bewilderingly cold P2. Winter woollies tomorrow! It’s another 15 minute 100 mph sprint to St. Valentin – any more and I would have to move away from the two noisy and unruly children who are clambering over all the seats annoying everybody in an otherwise quiet coach. Back to the hotel about 20:20, paid the bill to save them worrying about me hurtling out before breakfast tomorrow, and got a reasonably early night. 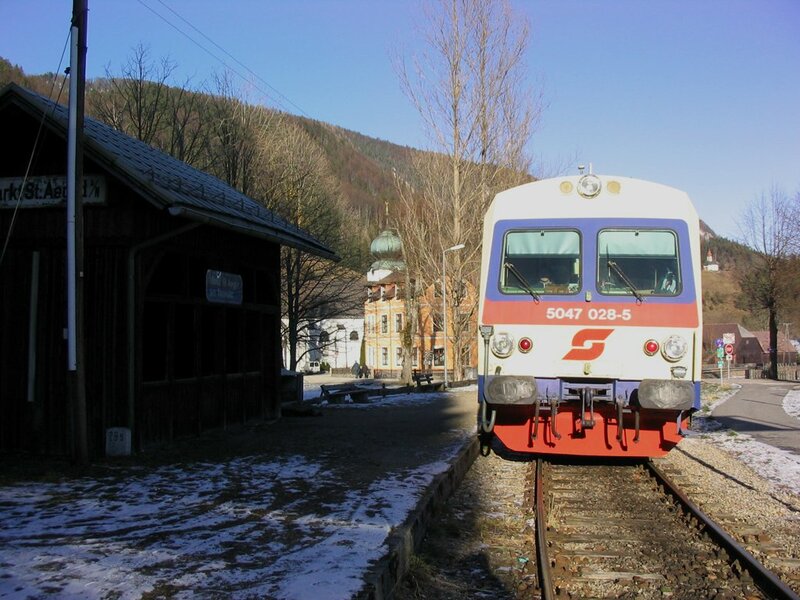 On 29.12.08 760mm gauge 5090 010 stands at Ybbsitz, working the one train a day M-F service from Waidhofen an der Ybbs. 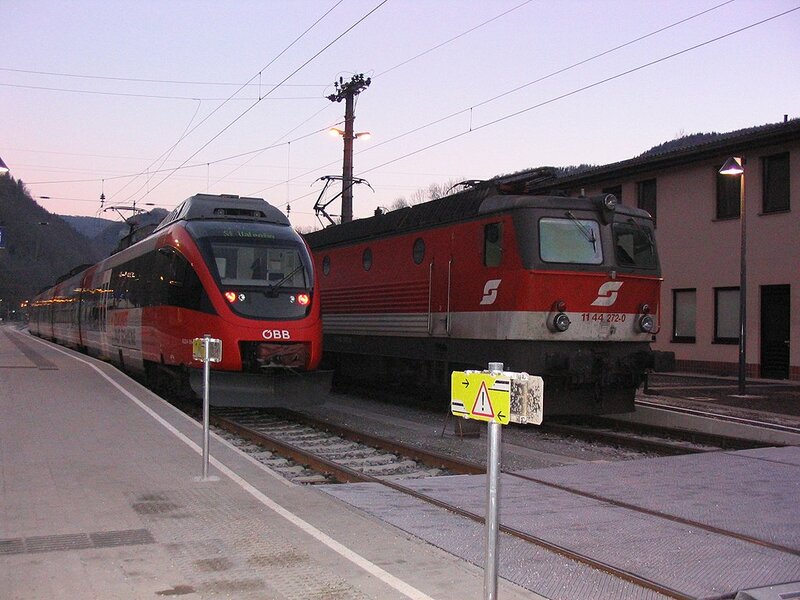 Later the same day sister unit 5090 012 is at Lunz am See prior to working R6912, 16:25 SuX to Waidhofen. On the return journey 5090 012 and 5090 013 meet at Großhollenstein. Having misread departures/arrivals for the second day running it took me a few minutes to locate the platform for Kleinreifling – which was also not the one advised by Hafas. As it’s a through train from Wien it wasn’t likely to go from the bay platform (11) but I hadn’t realised it was a through train. In the event it arrived at P5 just after I did and provided somewhere warm to wait. 1144 272 was the haulage on a double deck Weasel set, whose seats are markedly more comfortable than their DB equivalents. The thoughtfully provided 11 minute stop at Waidhofen allowed some semblance of (very) technical daylight to appear; luckily it’s another cloud-free morning. Further assistance was provided by R3511 which arrived late from Kleinreifling. This all conspired to make us 4 late leaving, but so slow is the timing to Oberland that we arrived there early and had to wait time. The scenery gets quite impressive nearing Kastenreith, where the St. Valentin line appears from a tunnel just before the junction. 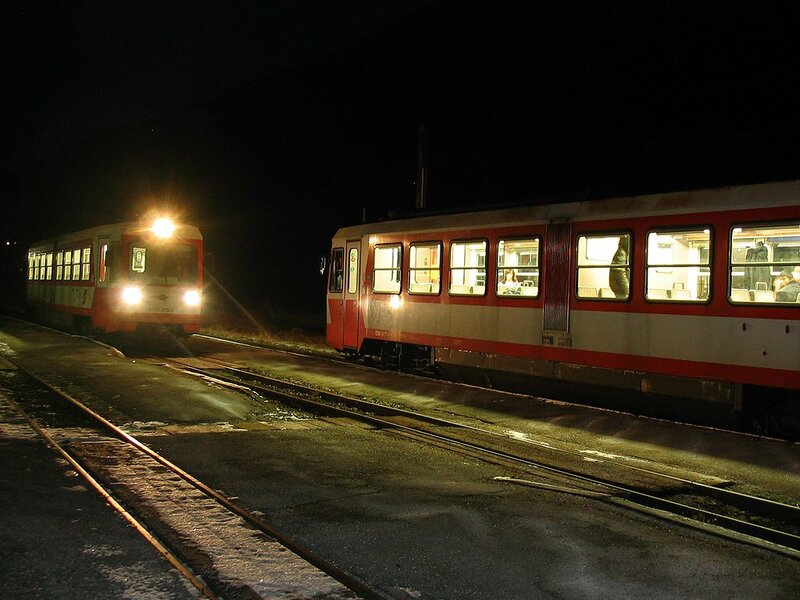 The platform’s between the two lines so getting your St. Valentin train from or to Kleinreifling is The Right Thing To Do! There’s a lake beside the line between Kastenreith and Kleinreifling (seen on the way back, it turned out to be artificial with a hydroelectric dam at the north end. An 1116-hauled freight with a passenger coach at the front, which passed through Kleinreifling while I was there, turned out to be a Ro-La. The kart for St. Valentin was a 4024 which left Kleinreifling with only your reporter aboard. …and it isn’t. Industrial grot north of Steyr and then its Floodplainland. But it’s a lovely sunny morning again for a nice pre-breakfast (hopefully) outing. Worked a treat! On time at St. V, off to the hotel for a wash and brush up, nice breakfast served at the prop’s measured pace (good job I paid last night!) and back to the station in just enough time for 1016 022 and IC545 at 09:48. It even had a seat for me despite being the 06-something from Innsbruck which I’d thought might ensure it was wedged. On time at St. Pölten so despite the prevailing shambles there I was in my seat by 10:34 for the 10:36 stopper to Krems, double deckers shoved by 2016 008. It’s a fairly gentle trundle to Krems although there is a significant lump in the ground before you drop down to the Donau. 37 minutes (less 1 late) at Krems which was more than enough to get to the Spar at the end of the station for some very cheap supplies. I didn’t note where we stopped last time – although P2 seems more likely I’m 99% sure it was under the car park (P3) and if so then it’s connection done. I’m not going to lose sleep over it anyway. The car park is a real monstrosity, making an otherwise reasonable station hideous. It seems I was quite lucky with my 2016 as the other train in the service was 5047 045, a 153-lookalike. There are a couple of ballast quarries along the way, one belonging to Frings and the other to (I kid not) Michael Wanko. Almost all the wagons in the various sidings seemed to belong to ÖBB Infrastruktur which was what led me to the ‘ballast’ conclusion. Back into the northernmost island at St Pölten unfortunately but then the moleworks went in my favour as the Hainfeld/Markt St Aegyd train had to use the ‘up fast’ (done earlier on IC545) to get to the branch. So connection done for that one. The train is a pair of 5043s with no indication as to which one goes which way! MStA goes first at Traisen so presumably it’s the front one. Gripmeister has just been round and confirmed ny guess. 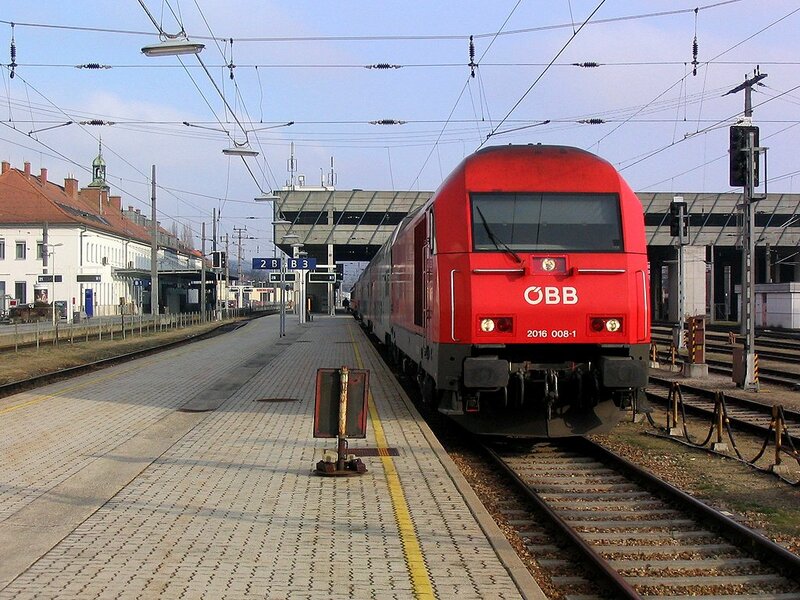 For the record, we used P1 at Traisen with the north (St Pölten)-bound units in P2. A bit of a drag up to Markt St Aegyd – the scenery’s OK without being at all dramatic and the timekeeping’s not all it could be. Still, provided I can make Hainfeld on the way back all is not lost. [I didn’t know the fun and games that were in store]. Dived out for a lightning phot at Markt St Aegyd and was back in my seat long before the driver had changed ends. Left MStA 7 late – the bloke doesn’t seem to care really. ‘Course, he knew he was booked 7 minutes at Freiland and I didn’t! [which will teach me to read the timetable before making critical comments]. Southbound service was there waiting, and we’re away on time. On time or near enough at Traisen too, where two units arrived from Hainfeld and went on the back of the one from Markt St Aegyd. The southbound units were on time too and the rear one (and I) set off for Hainfeld at 15:05 as booked. That it should be so simple. At Rohrbach an der Gölsen, one station from Hainfeld, the kart burst. After several attempts the driver fixed it; it staggered a few hundred metres then burst again.Lots more efforts including getting a passenger to help by pressing some buttons, and he finally got it to Hainfeld, bless ‘im. Instead of failing it there like any red-blooded British driver would, he tried to start back and it burst again. One final attempt and success – it staggered back to Traisen and got attached to something that worked! As for the branch – well, the kart made it far more interesting than it might otherwise have been. Back to St Pölten on time – right across the layut to P8 on the north side this time; P7 would have been ‘favourite’ but I’m sure it’ll all hook up one day! 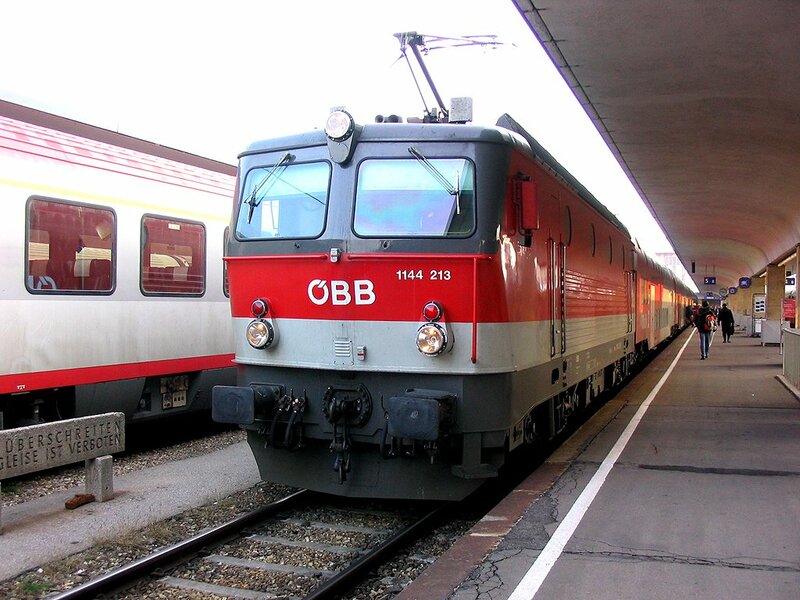 Then it was the ÖBB we know and love, with not a seat to be had anywhere on IC643 Salzburg-Wien and a nice stand to Hütteldorf.But it was only 35 minutes, and doesn’t an iPod help! 13 minutes wait there, for S2 as far as Rennweg, then out to Schwechat which proved to be 15 minutes walk from the Hotel Albrecht. The hotel proved to be under the flightpath into VIE when there’s an east wind. There’s an east wind. Quick dash back to town using Kaiserebersdorf which is nearer, to check in for tomorrow’s flight and get another timetable for a friend, then supper at the Schwechater brewery tap, a modern and soulless establishment. Their weissbier’s quite nice though, and so were the schnitzels, if a little too much! Early in the morning of 30.12.08 1144 272 at Kleinreifling with R3292 04:15 SuX from Wien Westbf, beside a Talent unit forming REX3608, 07:50 to St. Valentin. The sun's about as high as it gets in late December as 2016 008 waits with REX6016, 11:47 Krems an der Donau-St. Pölten Hbf. 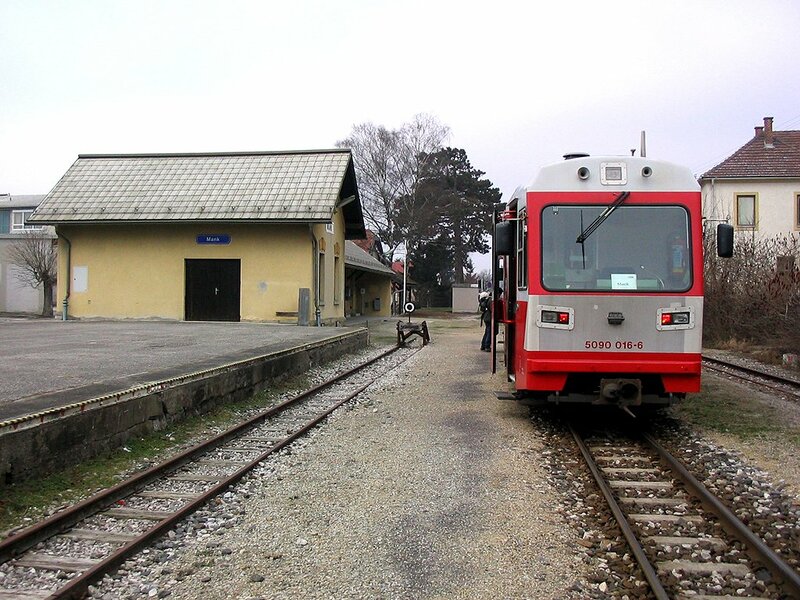 Single unit diesel 5047 028 stands at Markt St Aegyd, about to work REX 6729 to St. Pölten Hbf. Noticed last night that airport-bound S-bahns were less than punctual, and that several early morning ones came from ‘oop north’. Reluctant decision therefore, that 06:41 ex Schwechat probably wasn’t the intelligent man’s choice for a flight with gate closing at 07:10. So I settled for no breakfast and the 06:11 from the somewhat nearer (to the hotel) Kaiserebersdorf. Immigration was mega quick however, and I arrived at bus stop 8 at 09:34 for the 09:37 no. 77 to Slough. At Slough FGW had melted down, due (I discovered later) to ‘an incident between Ealing Broadway and Acton Main Line’. I heard a Reading train announced on P4 so hurled myself at that. It turned out to be a stopper running aeons late but did the job for me. Reading’s displays were showing a long queue of FGW’s 08-this and 09-that all running horribly behind time but by wandering round I eventually found XC’s Voyager forming 10:40 to Newcastle, stinking quietly in bay P7. This turned out to be routed Solihull so it renewed my acquaintance with the Small Heath-Bordesley Jn-St Andrews Jn-Grand Jn route which I hadn’t done for years. Well before the Proof House remodelling, anyway. Final stage was to hurl myself on to the 12:20 Virgin stinkbox to Edinburgh (as far as Wolves) and then bus it to Codsall for Banks’s Winter Ale and a lift home with my long-suffering spouse. That was it for 2008. 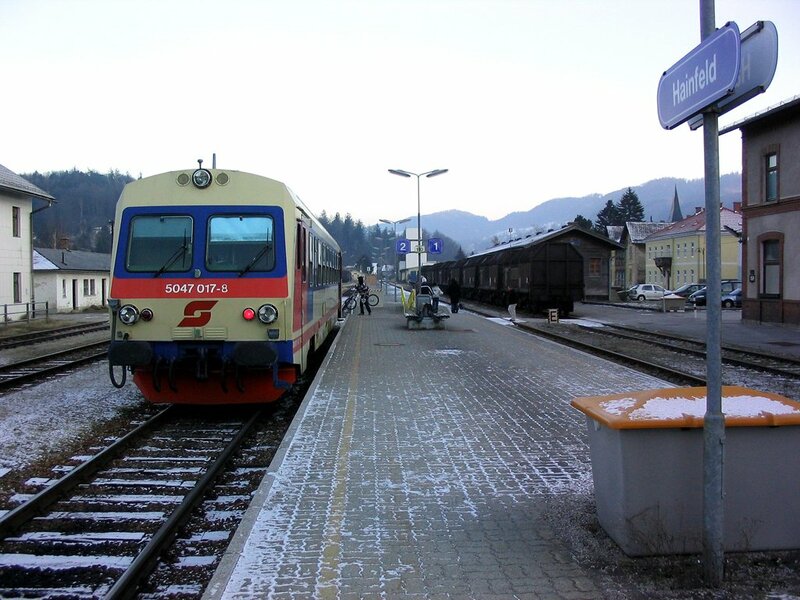 In July 2009, after the longest layoff for years (caused by the horrendous collapse of the pound resulting from the banking crisis), a 'one weekend only' service was on offer on the branch from Spišska Nová Ves to Levoča. On this Slovakian peg hung a trip mainly concerned with oddments in the Czech Republic and a cross border line into Poland.